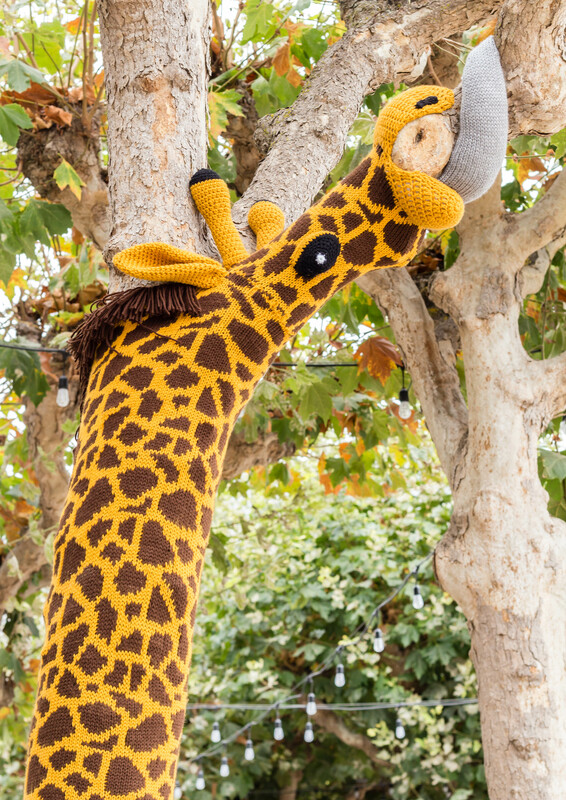 Knitting the Commons is a temporary art project that aims to ‘knit’ together over 80 trees throughout the Civic Center Commons (the Commons) in San Francisco, California. The Commons is the new name for the three blocks between San Francisco City Hall and Market Street, including Civic Center Plaza and United Nations (UN) Plaza. 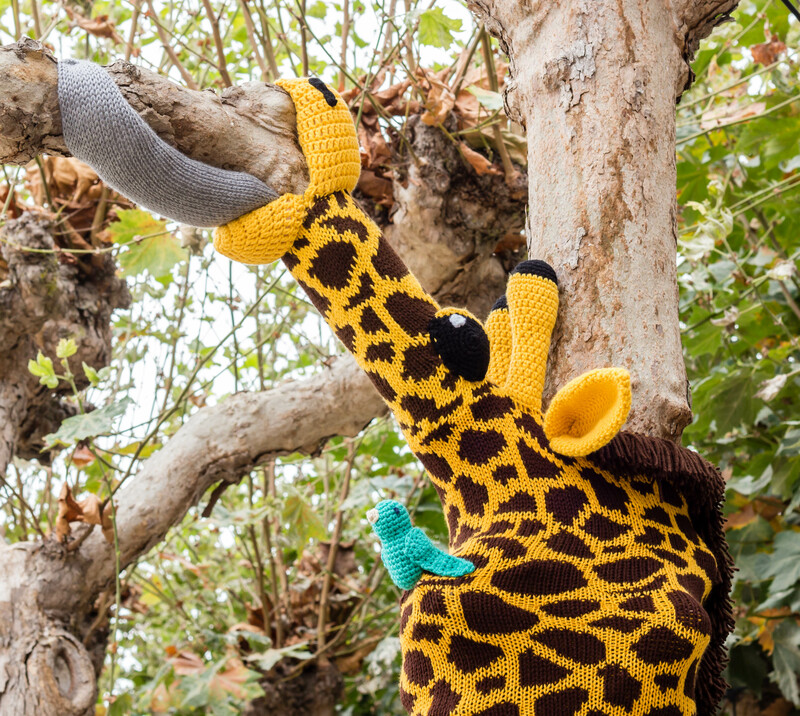 Working closely with Civic Center stakeholders, the Trust for Public Land and Knits for Life developed the large yarn bomb art installation to accomplish the goal of visually uniting the Commons with playful elements. Knits for Life, an artist-sister-duo, is leading the design and installation with input from the community. The installation stands to remain for up to two years. Phase 1, known as “Thread” was installed on about 75 trees in June 2017. Consisting of brightly colored bands (yellow, red and blue – Civic Center Commons’ colors), the intention of these wraps was to visually connect the Commons. Phase 2 brings a cluster of Land, Sea or Air Creature themed trees to each of the three blocks of the Commons. The theme was decided by the public through in person and online voting during the month of June. Phase 2 installation occurs throughout September 2017. 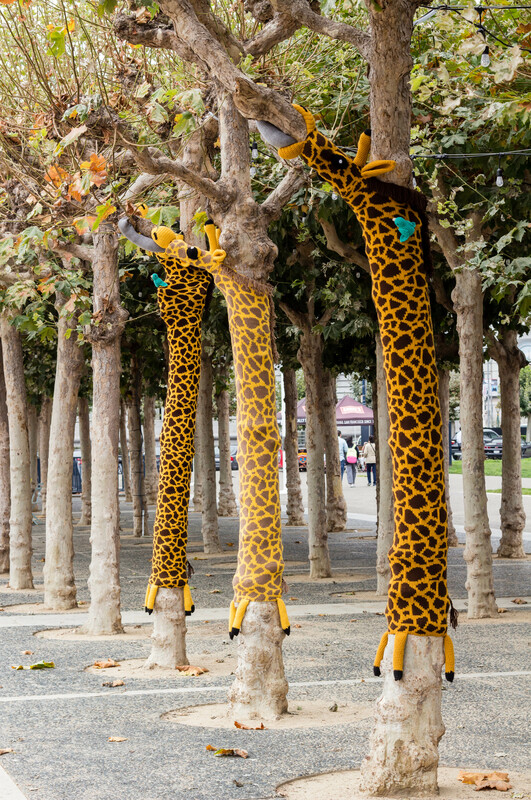 Civic Center Plaza will have “Giraffes of the SF Zoo”, Fulton St. will have “the Parrots of Telegraph Hill”, and UN Plaza will have “Giant Pacific Octopuses”. 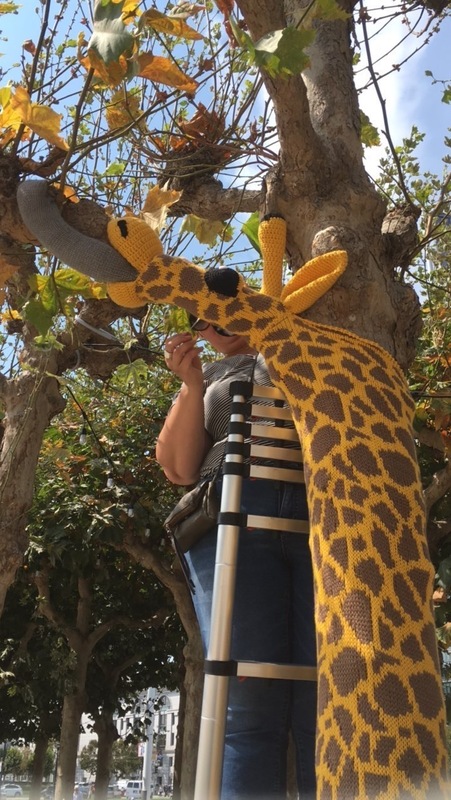 Where can I see the giraffes? : Civic Center Plaza, San Francisco, California. How long will it be up? : Phase 2 of the installation stands to remain in place until June 2019. It is being maintained and replaced where feasible. Who knit all this? 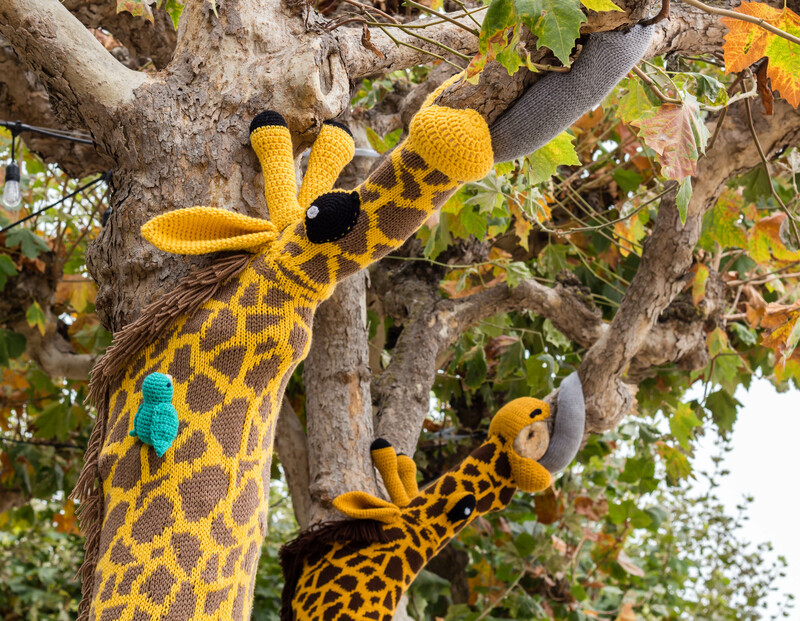 : The sister-artist-duo Jill and Lorna Watt, known as Knits for Life, custom design, knit, and crochet durable acrylic yarn by hand or using a vintage Brother KH-270 knitting machine in their San Mateo art studio. Each panel is then painstakingly hand-sewn on site with invisible seams to ensure maximum longevity and quality. What do the giraffes mean? : The theme was decided by the public through in person and online voting during the month of June. The public was given a choice of three concepts, and the winning concept was Land, Sea and Air Creatures. 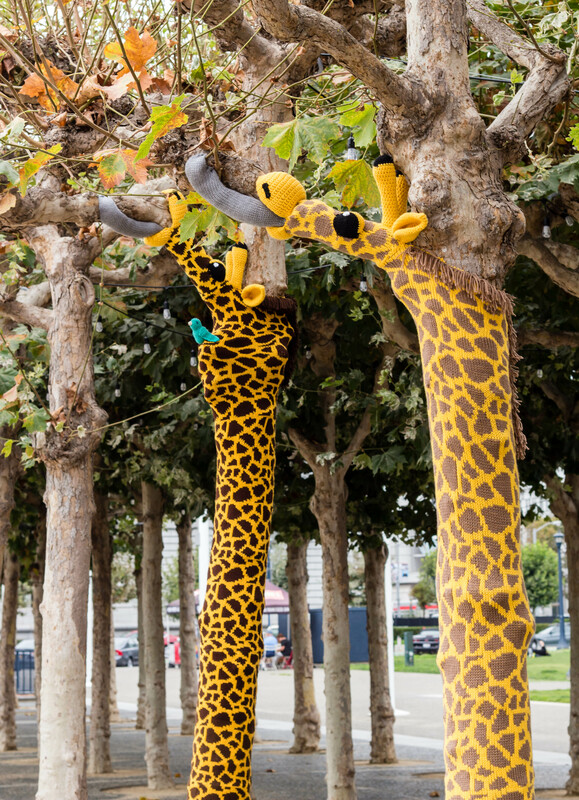 The artists strove to find a group of animals for each block that could both play with the specific shape of the trees and and illustrate a special connection to the San Francisco community. The San Francisco Zoo celebrated the birth of a new baby girl giraffe in 2016. Does it hurt the trees? : This project has been approved by the San Francisco Recreation and Parks Department, the Public Works Department and other stakeholders to ensure that no public assets are harmed by the installation. 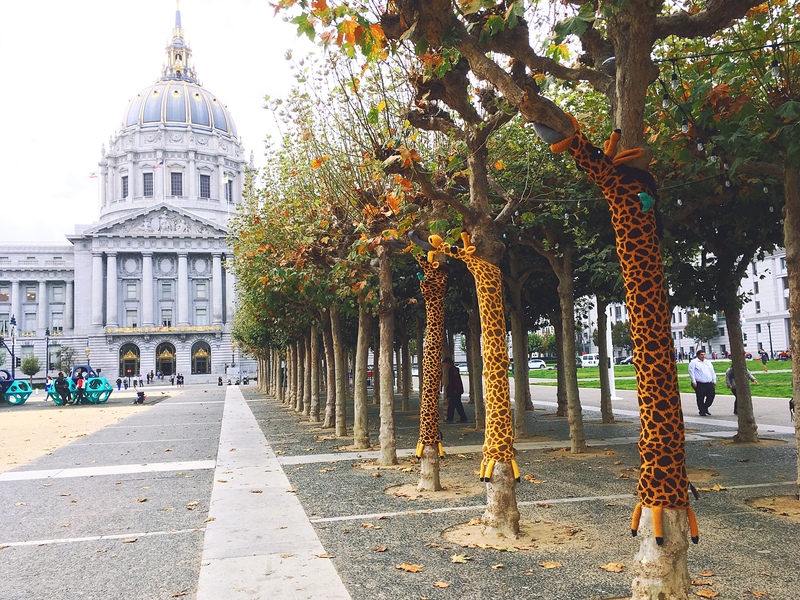 For example, branches on the pollarded trees in Civic Center Plaza are wrapped just one foot length from the trunk in order to avoid interfering with new growth on the upper reaches. 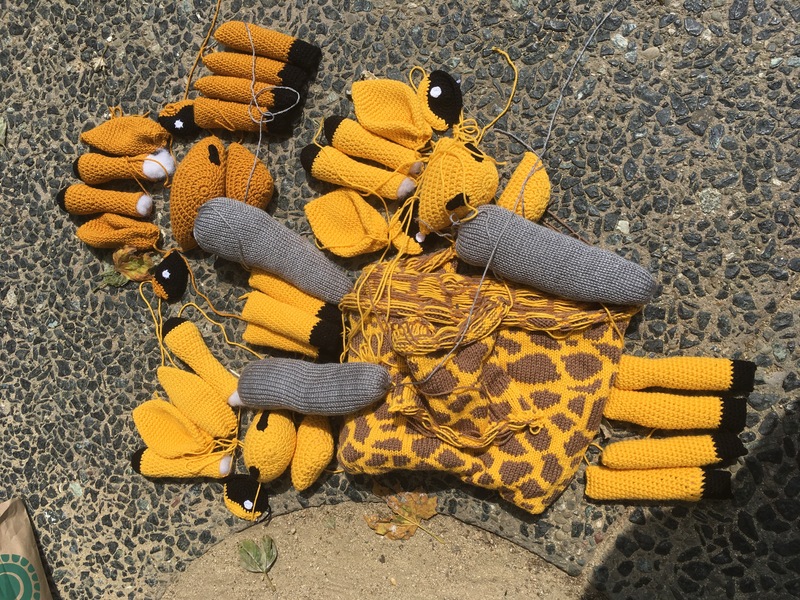 What happens to the knitting when it’s taken down? : Some of the knitting disappears by theft, and may be replaced after a risk assessment. While sometimes we wash and repurpose work, any panels that survive two years in this location will have served their purpose well and will be discarded.